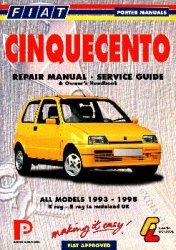 The Cinquecento 900 was introduced in May 1993, designated S and SX in the UK. It was fitted with a mildly developed version of the well-established iron-block OHV engine, inherited from the 127, Panda and Uno, with the same (903cc) capacity for Italy, but with slightly reduced capacity (899cc) for the UK and other export markets. All 899cc engines have quieter, hydraulic valve tappets. The 900 SX has electric front windows, glass sunroof and remote central locking.